The UK government will fast-track the implementation of retired businessman Sir Ian Wood's recommendations for maximising the UK's remaining offshore oil and gas resources. This will include setting up a new regulator to oversee the industry. It will also include improving collaboration between the government and the energy industry. Sir Ian said the changes would add "at least" £200bn to the economy over the next 20 years. "I see this as a watershed opportunity," he added. "We need to maximise the recovery of our hydrocarbon reserves and attract more investment." Media captionSir Ian Wood: New regulator "would allow collaboration"
Exploiting the use of existing technologies to maximise recovery of oil and gas. 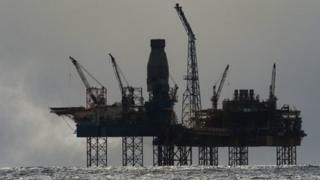 The UK government said the changes would produce an extra three to four billion more barrels of oil. "The UK government can afford to support the industry and make it profitable to extract the increasingly hard-to-reach oil and gas in the North Sea," said Prime Minister David Cameron. The UK's tax revenues from oil and gas in 2012-13 were £4.7bn lower than the year before, amounting to a 40% fall. The report comes as the UK and Scottish cabinets prepare to hold separate meetings in the Aberdeen area, as they address the future of the North Sea oil industry. The Scottish government said it supported the plans to implement Sir Ian's recommendations in full. "The North Sea has suffered from poor stewardship from the UK government to date, and the time has come to address that," said finance secretary John Swinney. Mr Swinney added that if Scotland were to gain independence after the 18 September vote, a Scottish Energy Fund should be established which would receive a proportion of oil and gas tax receipts. However, Tom Greatrex, Labour's shadow energy minister, warned Scottish independence would jeopardise the success of the Wood review. "Fragmentation of fiscal and regulatory regimes through separate arrangements in Scotland from the rest of the UK would increase risk, reduce efficiency," he said. It is the first such review for more than 20 years. Energy Secretary Ed Davey commissioned the report from Sir Ian, the former head of oil services supplier Wood Group, last June. When he ordered the report, Mr Davey said the sector faced "unprecedented challenges that require new thinking". This included declining drilling and production rates, as well as ageing equipment. And he said the UK had to grasp the "huge opportunity" of exploiting the remaining deposits. Sir Ian was chairman of Wood Group from 1982 until 2012. He also served as its chief executive from 1967 to 2006.